Wow, that mini looks awesome, MH! You really know how to find 'em. Mage Knight has a wealth of cool figures, I love that series. On e of my buddies is getting rid of all of his MK collection and said he'll just give it to me the next time he sees me... unfortunately, it's not that often. But I can't wait to see what interesting figures lie in wait for me, and how many will be useful for Hellboy. Fulton is definitely getting added to Hellboyscape... I'm just not sure if he's an ally or an enemy! I guess an enemy, since Hellboy needs to go fist to fist with him. Anyway, I'll get going on him tonight, and I'll have him up tomorrow afternoon. The MK series has lots of great-looking robotic Golems, but this one seemed to fit the best, especially since in the film Hellboy rips off an arm and uses it as a weapon. The mini is slightly diffent than the film version, but it works. 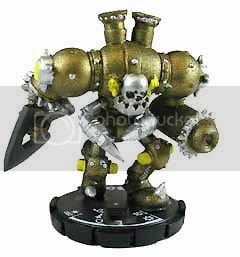 The mini is a tad pricey, but not too bad... the 'weak' version [in yellow, which looks coolest for the Golden Army anyway] is the cheapest at around $3 on ebay right now. I mention this because I'm trolling for ideas, and I know you're full of it... uh, them! I was also thinking about a Unique Hero to represent the evil elf from HBII, Prince Nuada. He may have some kind of bonding with the Golden Army, but another Unique Hero could [with a good roll of the d20] prove themselves more worthy of controlling them. I'm so happy that you will include him Garada. I think that he will work great as a villain. 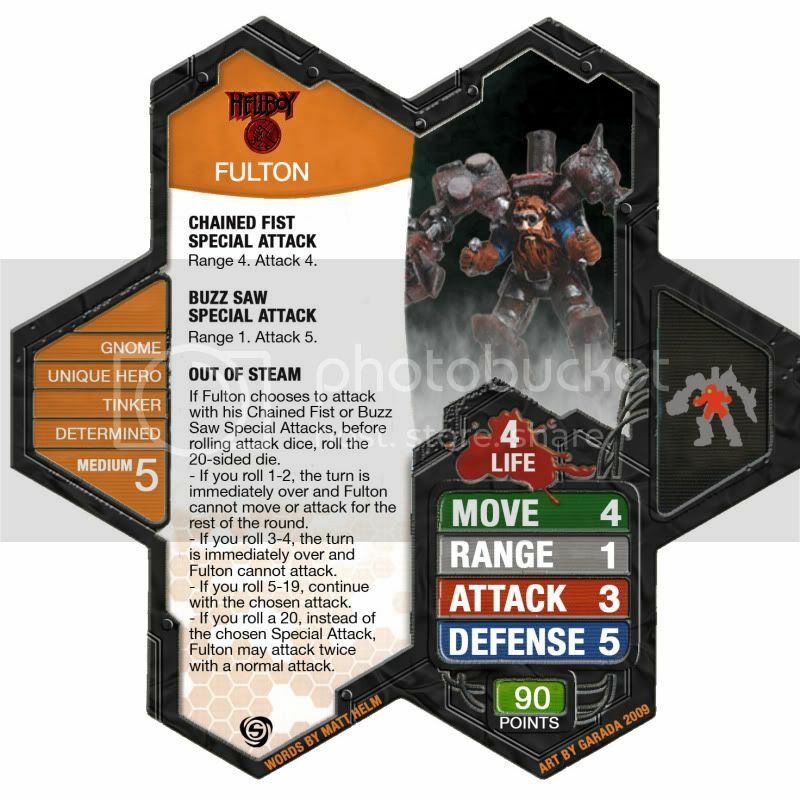 I was also planning on considering a few of the other Mage Knight Steam related figures (I think there is a Golem and a Mauler) as maybe a two figure unique squad that would have bonding with their inventor, Fulton the Tinker Gnome. The one you picked for the Golden Army is great. I'll have to keep my eyes open for the figure, my wallet prepared for the price, and my mind open for some ideas. For future customs, I think that the Indy Clix Saurian Trooper is begging to be a common hero in Hellboyscape. I'm also working on a possible Demon (not sure if uinique or common hero, I'm leaning toward unique to avoid the temptation of buying more than 1 mini) made from the Mage Knight "Sand Minion". Look him up when you get a chance. Last edited by Matt Helm; April 14th, 2009 at 05:56 PM. If you were going to attack with Chained Fist to attack someone at a range and you roll a 20 for Out of Steam, you recieve no benefit since his normal attack is range 1. Is that the intent? Yes. the intent was, that on a 20, Fulton recognizes that he will have a mechanical favor and instead defaults back to his normal attack against adjacents. As a reward, I allowed him to attack twice as if he surprised the adjacent enemies with this unforseen normal attack. Last edited by Matt Helm; April 14th, 2009 at 06:08 PM. Yes. It does make sense. I like when we put an almost "roleplaying" feel these cards. It makes them that much more enjoyable. Thanks for the clarification. As I said Necro, you're always welcome to contribute to Hellboyscape! In fact, it would be an awesome honor! I must disagree about the only worthy parts of HBII however... I loved when Hellboy and Abe got drunk, I thought the fight against the earth elemental was pretty cool, and I really loved the fight against the tooth fairies! I really like the idea of different units comprising the Golden Army. I consider what we're doing for Hellboyscape to be it's own version or adaptation of Hellboy... the Golden Army is a great idea, but it needn't adhere strictly to the film... especially since the film is just an adaptation of the comics anyway. And since Necro likes the Prince, he's now a 'must have' figure in the series. BTW, I love the idea of having a few of his 'steam-punk' creations that have a synergy with him. Also, I already have a Saurian Trooper... just one, but YAY for me anyway. I'll give you that the scene was hilarious, but up until then the pace had been verrrrry slow and I was extremely disappointed when that was the only thing they could come up with to switch things up. True story: the second time around, when the family was watching at home, I sat the whole thing out except that last with the duel/Golden Army. Waaaaay too short and anticlimactic, IMO. and I really loved the fight against the tooth fairies! They were neat and scary, but I felt like the good guys got out of it too easily. It was all very convenient. Yes, the Prince was a badass and I would be interested to see an HS adaptation! Yeah yeah, my gnomeboy, Fulton in the house!!! I gave him Super Strength, but I wasn't 100% sure on that.I'll have time this afternoon to make changes and adjustments. He is one of my favorites... what figure do I need to buy? The piece is a Mage Knight "Steam Tinker" but I can't remember which one had the blue shirt. I'm guessing the pic is the standard one as that usually carries the blue trim (weak yellow and the powerful one red). Thanks for producing another beauty. I'm hoping for some feedback so that we can tweak the wording as needed. Oh, and the word "attack" is missing a "t" in Out of Steam. Last edited by Matt Helm; April 15th, 2009 at 11:27 PM. Thanks for writing another beauty! Hellboyscape has really taken on a life of its own, thanks in large part to the many awesome customs you have written. It's really starting to feel like a fleshed-out, well-developed proper expansion to Heroscape and stand-alone adaptation of Hellboy. Please see the post in my custom thread entitled 'Hellboyscape Shout Outs' for more fawning over you. Which one is missing the 'T'? I'll fix him tonight and get the corrected version up tomorrow on my lunch break. If you notice any other errors, or want any changes made, shoot me an e-mail [I won't have access to Heroscapers again until tomorrow]. Sorry MH, I lied! I won't be able to update Fulton until tomorrow AM. My daughter's school is having a Spring Carnival this evening, and I have to head over there directly after work... so I didn't bring my laptop.